France is something like the godmother of the world of wine, as it has long been the benchmark for fine wine production and regulation. Though many other countries around the world are producing amazing world class wines, further diversifying the world of wine, France still produces many of the best wines in the world. It is the number 2 producer of wine in the world behind Italy, producing well over 4 million tons of wine per year. But, French wine consumption per capita has been falling as the U.S. wine consumption is gaining. As American consumers drink more wine, we are even more interested in quality French wine. There are two key pieces of information to look for on a French wine label: (1) appellation or varietal and (2) classification. Rhone Valley: Syrah (Cote-Rotie, Crozes-Hermitage), Viognier (Condrieu) and Grenache-dominated red wine blends (Cotes-du-Rhone, Chateauneuf-du-Pape). Vin de France (formerly Vin de Pays and Vin de Table): table wine that is labeled by varietal. Looking at the wine label for appellation and classification tells you the most important things about the wine: varietal and quality level of the wine. Then, you can look to the vintage and producer for more information. But, as long as you know the varietal and classification, you can make a guesstimate about whether you think you would enjoy the wine and whether the price seems appropriate for the classification. Pop Quiz! What is the varietal and classification of this wine? The Cork Chronicles has designated France as our wine country of the month. Throughout the month of March follow us on Twitter and Facebook for more interesting facts about the wine regions of France. According to the label, this is a Grenache blend from Chateauneuf-du-Pape and the classification is AOC /AOP. If the restaurant has a Sommelier on staff, do not hesitate to consult with her. Give her some guidance on your price range and what you will be eating or typically like to drink, and pass the burden to her to select something that everyone will enjoy. Knowing that you like chicken but not beef narrows down your choices on the food menu, and the same is true with the wine list. Knowing that you like dry white wine will cut the list by more than half. Even when using the services of a Sommelier, their job is much easier when you can articulate the type of wine you like to drink. A full-bodied Cabernet Sauvignon will overwhelm a seafood salad just as a light-bodied Chardonnay from Chablis won’t stand up to a steak. Pair light-bodied wines with light dishes and vice versa. Restaurant wine lists often list wine from lightest to fullest in body. Pair cuisine types with the wine that is native to that region. For example, if you are having Italian cuisine, pair it with an Italian wine. The wines of certain regions are designed to pair well with the cuisine that is native to those regions. Of course, this is only a rule of thumb. There are many fantastic pairings matching a specific cuisine to wine from the other side of the world. If you still have no idea which wine to select, choose a versatile wine that is higher in acidity. Wines that are higher in acidity are easier to drink with food. I find that two of the most versatile wines for food pairing are Pinot Noir for red wine and Riesling for white wine. When in doubt, select Pinot Noir or Riesling. What have you found helpful in selecting wine from a restaurant wine list? The English version of SLOW WINE, a guide to Italian vineyards and wine, has just been released. Slow Wine evaluates wine in a new way—looking not just at the quality of the wine or even the value, but also at the winemaking practices of the vineyards. According to Slow Wine editor, Giancarlo Gariglio, the symbol of the snail (as used in the guide) is the highest rating for any vineyard, denoting the production of organic wine that is representative of the terroir and has a good relationship between price and quality. “To be very good quality, it must be clean, fair and good,” says Giancarlo. He believes that too much emphasis is put on the taste of the wine without evaluating the practices used by vineyards or the affect that negative practices have on consumers and the environment. Italian consumers and the press have been putting more pressure on vineyards, in recent years, to use green winemaking practices and preserve Italy’s beautiful landscape. As a result, many of Italy’s vineyards have gone green. Slow Wine holds 2000 vineyards across their country to measurable standards that are shared with the world in its guide. MASCIARELLI CASTELLO DI SEMIVICOLI TREBBIANO D’ABRUZZO DOC 2008: The beautiful Castello di Semivicoli vineyard is on my list of places to visit. This is a great Trebbiano with prominent notes of citrus and minerality. It is unique for its creamy texture, resulting in a fuller body very well balanced with notable acidity. It was very good alone, but I imagine it also would be very good with food, i.e. seafood pasta or salmon. G.D. VAIRA BRICCO DELLE VIOLE BAROLO DOCG 2007: This is a relatively light-bodied version of Barolo. It has the complexity of a typical Barolo but more finesse and elegance than is typical of such a young Barolo. Its notes of green herbs, figs, violets, and tobacco are ready to be enjoyed now. MOSSIO FRATELLI NEBBIOLO LANGHE DOC 2007: This vineyard earned Slow Wine’s coin rating for great value. I enjoyed all three of their wines which were complex yet easy-drinking. 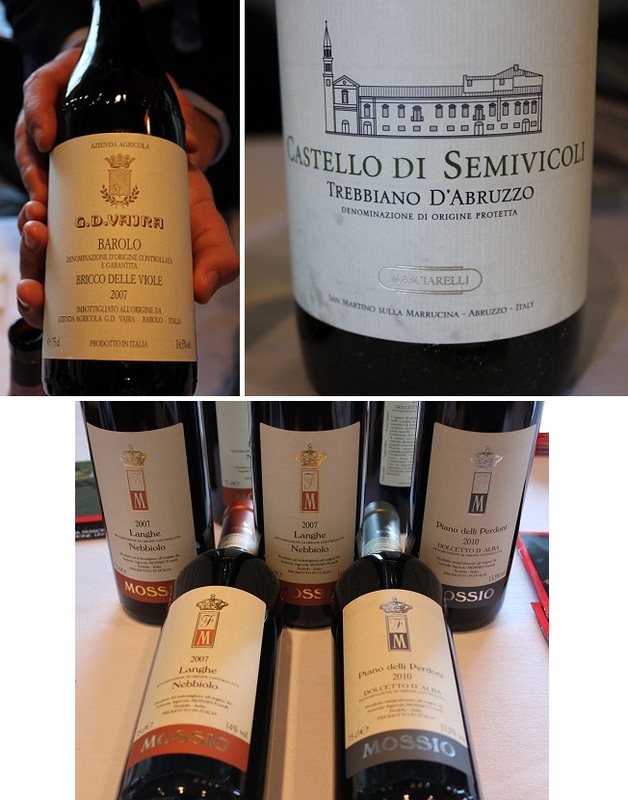 I particularly enjoyed the Langhe Nebbiolo. I imagine this wine would be perfect with a cigar while relaxing in an oversized leather chair and feet propped up an ottoman. It has the weighty presence of Nebbiolo yet it’s so smooth. The next time you buy Italian wine, consult the Slow Wine guide to select wines that not only taste good but are made by vineyards that are good custodians of the land and set fair prices. Lanson Champagne just arrived to the U.S. market in December, though the Lanson house dates back to 1760. I’m glad they finally showed up to the party. After I popped the cork, this bottle went quickly. It is a lovely rosé Champagne that can be served as an aperitif (before dinner) or with dinner, as it is dry. It has prominent notes of white flowers and lavender balanced by strawberry, melon and toast with a touch of sweet cream and citrus on the back end. It is supple in texture with a long, smooth finish. Begin your evening toasting with Lanson Brut Rosé, pair it with fish and poultry dishes or with fresh fruit or cheese for dessert. Paul Jaboulet Aine “Les Cedres” Chateauneuf Du Pape 2006 is a red wine blend from the Southern Rhone region of France. The blend is comprised of 70% Grenache, 15% Cinsault, 10% Syrah and 5% Mourvedre. It is perfect for a romantic dinner for two, and absolutely divine with red meat. Its notes of fruit, herbs and spice are very well balanced with moderate acidity and sweet tannins. It is boldly flavored with the sweet meat, herbal and spicy notes you expect to find in a Southern Rhone but its elegance and seductive charm is reminiscent of a Pinot Noir. This one is for lovers only. Late-bottled-vintage (LBV) Port is a treat, especially when paired with chocolate or blue cheese. 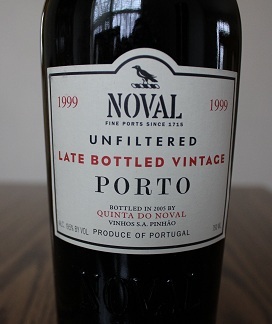 Noval Unfiltered LBV Port 1999 is a fantastic value. It has the rich flavors typical of a LBV Port. Because it was not filtered, it has a fuller body, adding to the intensity of the aromatic bouquet. I suppose that everyone will be eating chocolate on Tuesday, but if you (like me) aren’t much of a chocolate person, it is heavenly paired with blue cheese. One bottle will go a long way at a dinner party. I recommend decanting prior to drinking. 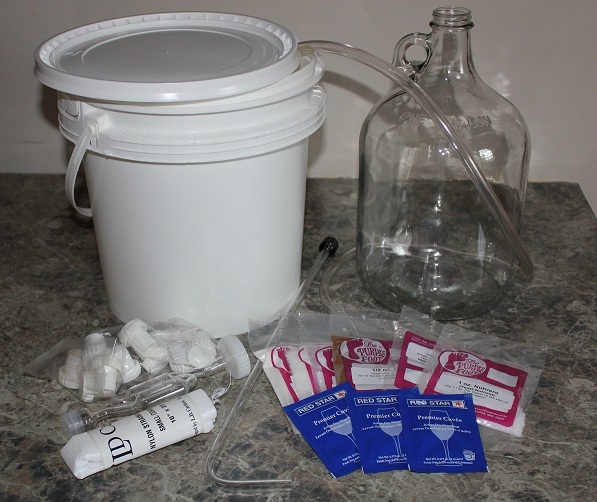 About a year ago, one of my favorite people bought me a home winemaking kit. It took about six months to get the wine kit in my possession because it was forgotten in the wine shop it was ordered from, or I forgot to bring it home with me after a visit, or she forgot to bring it with her when coming to visit me. Even after I received the kit, my neglect continued as it sat in the closet for months. During wine harvest season in the Fall, I was inspired to break the box open and give it a go. But, once I looked inside the box, I realized why this winemaking kit had been ignored for so long—it looked like too much work! There was a hose and other unknown objects inside the box, and I would have to purchase additional supplies to get started. So, I closed the box and put it back in the closed for another couple of months until I felt brave enough to give it a try. Finally, I decided to make blueberry wine. I very diligently (but also reluctantly) worked through the winemaking process. I began by sanitizing all of the tools and supplies to avoid any potential bacteria or mold growing issues. To begin fermentation, I crushed 6 pounds of blueberries and raisins in a loosely tied straining bag then added water, sugar, and a few other ingredients. After 24 hours, I added the yeast, starting the fermentation process. The fermenting must had to be stirred every 2-3 days for about a week. Next, the first racking (the process of separating the juice from the sediment) required me (actually my Dad) to siphon the juice into a glass gallon jug with a fermentation lock attached where it completed the fermentation process. Another racking was required before I bottle the wine for aging. 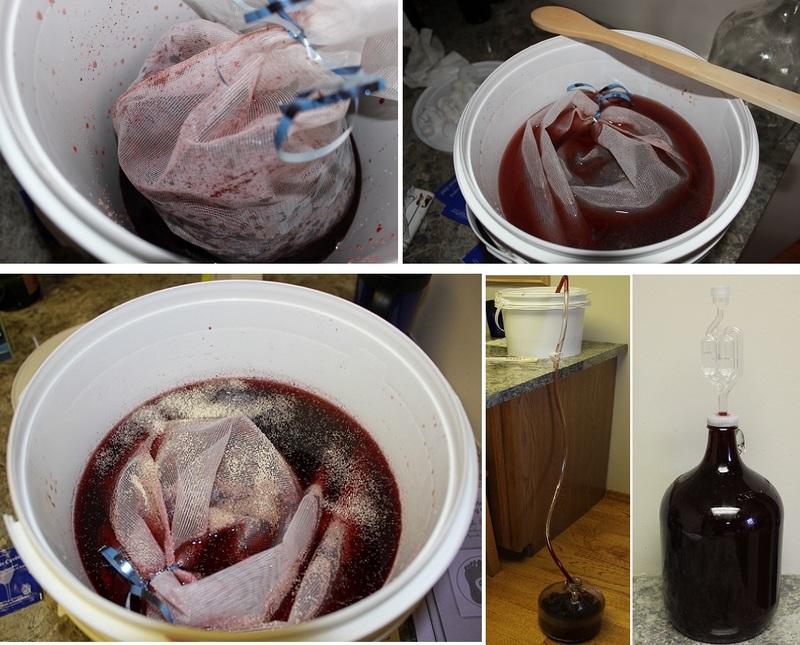 In this case, I simplified bottling by siphoning the wine back into the glass jug and sealing the jug. This young blueberry wine must age for 12 months. I make no promises on what this wine will taste like after it ages for a year, but I can promise you that I will be adding winemaker to my resume …just kidding. I’ll leave that to the pros because I got no enjoyment whatsoever from this process nor do I recommend that you try it at home. Nevertheless, check back with me in a year to find out what the wine tastes like. Have you ever made wine at home? How did it work out for you? The Cork Chronicles shares wine tips and recommendations and chronicles my wine tasting adventures to help enhance your wine drinking experience and empower you to make great wine selections. Thanks for visiting!